I'm unable to get an image of what I am trying to have fixed as each time I attempt to screenshot the black specks/lines, they do not show up in the screenshot. The best way I can describe them is that they are little black specks or lines (Depending on my settings) and the 'Aggressiveness' of them also depends on my settings. When they appear, they appear for only maybe 500 milliseconds or even less, if even at that small range. They are not truly that bothersome but they are noticeable enough for me to desire to try to fix them. If I can not fix them, that is fine too. The game I am trying to run, by the way, is .hack gu vol 1. 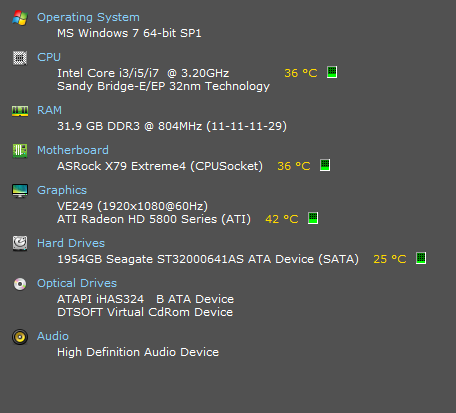 With my computer specs, no matter what settings I use, I run at a constant 59 ~ 60 FPS with no drops at all. So I do not think it is my settings that would be causing the 'Problem' that I am having. The RAM is 1.6k mhz, by the way. I'm not really sure why it shows 804. Is there any way to fix the black lines/specs? Sounds like you have an issue with GSdx when your game tries to do some effect. You have 4x upscaling selected which can cause these artefacts due to inaccuracies. 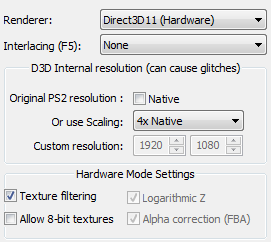 Try running the game in native resolution and see if that fixes the glitches. I have switched to the native resolution as you suggested, rama. But it only makes it much dramatic and frequent. When I say dramatic I mean the black lines are much bigger and there are obvious squares in the lines. Next step: Check software rendering (F9 when in-game). If that fixes it, it's a problem that could get fixed by using the skipdraw hack. Check the guide on how to try out.